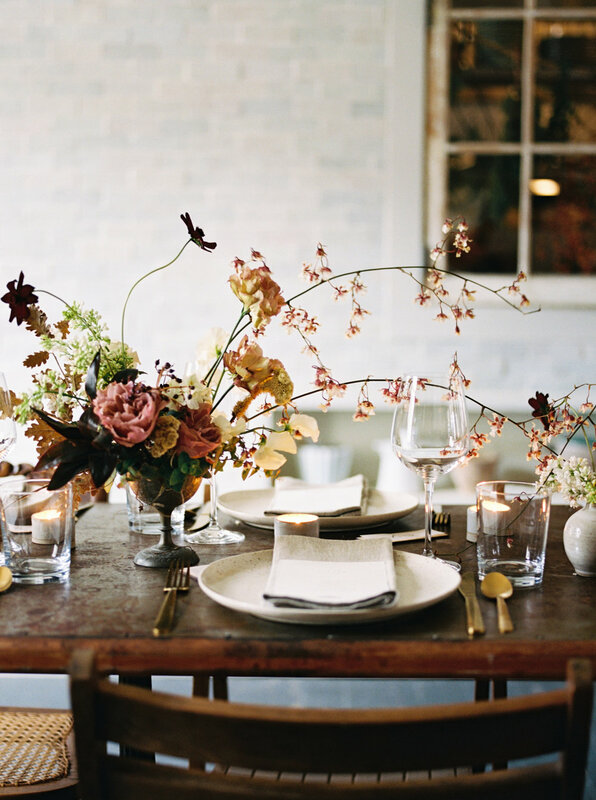 If you want to see your wedding featured, floral design is a key player. 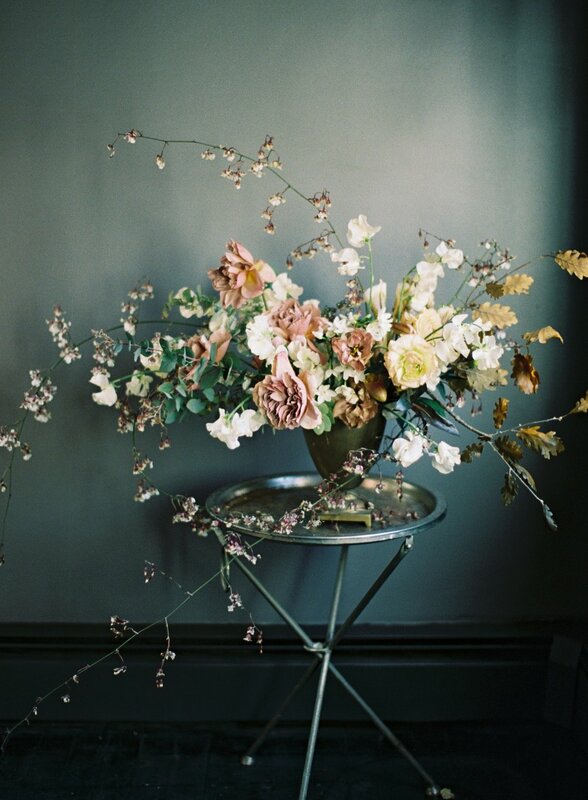 Blogs adore showcasing innovative floral design, but what are they really looking for? Here are the top elements that will catch an editor’s attention. Floral design is all about shape and movement. Gone are the days of compact, rounded shapes and simple vases of flowers. Blogs and magazines want fresh ideas and are looking for florals composed in interesting shapes. The Japanese practice of Ikebana is making a huge impression on floral design right now with shapes that showcase natural movement, growth, and organic shapes. And, conveniently enough, bouquets that are created in this style are much more photogenic and much lighter than a standard bouquet! My favorite florists showcasing composition are the talented ladies of Studio Mondine. While I think they nail all of these floral design elements, they always catch my attention with their ikebana inspired compositions. Original color palettes in floral design are a clincher in getting a feature. Though they’re classics, consider skipping the ivories and blushes in favor of something with caramel and gold tones, peachy pinks, and deeper hues, such as chocolates and deep wine tones. Alternatively, pair ivories and whites with interesting cool tones, like pale blue for a refreshing and interesting take on a pastel palette. Caramel, chocolate, wine-I mean...could it really be a bad thing? Tip for palettes: If you’re keeping your palette classic, pair it with at least one of the other important elements like composition or texture. Otherwise, skip the ivory and blush for something more fresh and innovative. My favorite designer for original and interesting color palette is Sinclair and Moore. Even when Steve opts for a classic ivory palette, he pairs it seamlessly with iconic shapes or interesting textures to create something publications line up to show. Along with palette is texture. Texture is another massive floral trend right now-adding in dried leaves and pods, soft grasses, painterly smokebush, or leathery magnolia create a head-turning effect. If you’re opting for a simple color palette, consider adding textural interest in this way. What to skip: I do love olive leaves and eucalyptus-I probably always will, but they’re done a lot. Try broadening your horizons and having some fun. My favorite floral designer for textural components (and really, all of these) is Kelly Lenard. With a fine art background, she creates florals that have so much dimension that you can feel them, even in a photograph. Her work is distinctive, creative, and deeply thoughtful. While simple vases of florals make sense, blogs and magazines die over floral designs that make a statement. Think of hanging installations, a statement centerpiece for a welcome table, a floral arch and aisle arrangements like you’ve never seen before, and centerpieces that create movement and conversation. Individual elements don’t really clinch an editor’s attention. They love seeing comprehensive design throughout an entire day. The proof of your stunning floral concepts is in the photos. Make sure your photographer has ample time to photograph the design elements without being rushed. This allows us the creativity to move pieces to ideal lighting condition and photogenic settings when needed, which will be the pivotal key to an editor wanting to show off your day. The problem is that they don’t deliver-they go back to their traditional shapes and compacted designs, just adding more flowers to make the bouquet bigger, but also making the bouquet really heavy to hold. Additionally, because they don’t really understand how to achieve the voluminous bouquets, they add in “big flowers” to take up space, even if they’re dated. This is basically a death sentence to publications. Hire a florist whose body of work shows an innovative mindset and and understanding of current design ideas. Don’t hire someone who simply says they get it and can deliver but doesn't represent your vision with their body of work. Ask questions about how where they find inspiration and how they stay educated and current. When was the last time they attended a floral design workshop? Even if a shop has been in business for 30 years, if they’re constantly educating themselves and pushing to create fresh work, you’re likely in for a treat. And bonus points if you’re hiring someone who teaches floral workshops-look for workshops photographed by fine art photographers and picked up by blogs afterward. Then you know that, if florals are high on your priorities, you’re getting the most skilled of artisans. Avoid dated flowers: Flowers go in and out of style. And the out of style flowers are often less expensive and easy “fillers.” But you’ll lose your chance of publication if an editor spots lilies, carnations, standard roses (like the ones you can grab at your local grocery store) and even traditional hydrangea. Get our best advice for a seamless and beautifully documented wedding day.